I know it seems like a silly thing to say, but it’s surprising how often it seems like people feel like they are something entirely different. 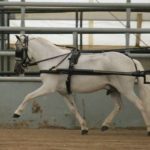 Miniature Horses who show in halter are horses too. They’re not some mystical being that needs entirely different care and management. Believe it or not, they’re still horses. That means they eat grass. Or in the winter, dried grass, which is also known as hay. 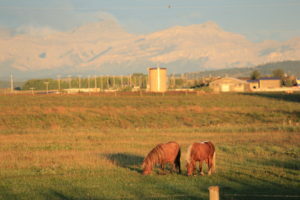 Horses evolved to eat a large amount of relatively poor quality forage, and their digestion is ideally suited for this environment. Humans evolved to eat when food was available, in meals. As a result, our bodies produce stomach acid only in response to food, only when it’s needed. Horses are different. Their digestion relies on a steady, nearly constant supply of food, so their bodies produce stomach acid constantly. That stomach acid, without a steady supply of forage as a buffer, begins to eat away at the lining of the stomach, causing painful and dangerous gastric ulcers. Pasture, hay, cubes, pellets, alfalfa, haylage … it’s all forage. 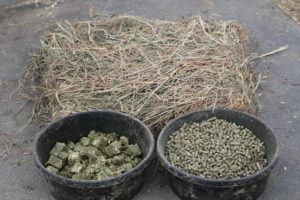 To prevent colic and gastric ulcers and generally promote good digestive health, forage must be the biggest part of your horse’s diet, at least 70% of their total ration to be safe, and never less than 50%. Many horses can be healthy, happy and productive – even as show or performance horses – on a diet of solely good quality forage. 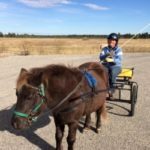 All horses (and remember, Miniature Horses are horses) should be fed a maintenance diet of 2% of their body weight in forage per day. 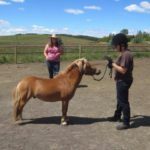 This is where a lot of people new – and not that new – to Miniature Horses can struggle. Issue #1 – They feed them the same amount they fed their 1000 pound horse. 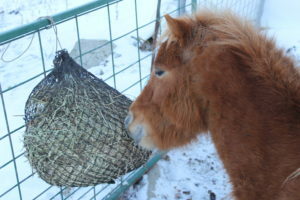 2% forage for a 1000 pound horse = 20 pounds of hay daily. That would be four times as much as would be appropriate for an average 250 pound, 34″ Miniature Horse! 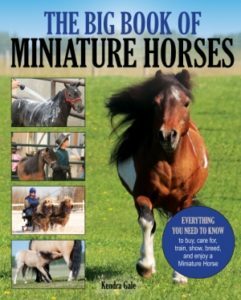 Issue #2 – They feed “a handful” of hay because “everyone says Miniature Horses get fat on air.” 2% forage for an average 250 pound 34″ Miniature Horse = 5 pounds of hay per day. That’s significantly more than a “handful”! You’ll notice that there was no mentions of “flakes” – a flake is not a standard unit of measure. Even from one bale to the next a flake won’t be the same weight. The same goes for a “scoop” of cubes. Get out a scale and actually weigh your forage – you don’t need to weigh it every feeding, but until you have an actual visual of what one day’s worth of forage looks like, you won’t know whether your preconceptions range high, low or right on target. Many people are very surprised when they actually weigh their feed, and discover they’re feeding far too little. 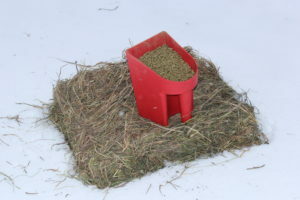 And this doesn’t even take into consideration the variation in nutritional quality of hay … you may need to feed more in a lower quality hay, and less of a richer hay for the same nutritional value. 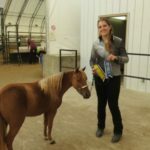 Becoming proficient at monitoring your horse’s body condition score (BCS) will allow you to make adjustments as needed to keep them healthy and happy. So what if you do have a fat horse? First, make sure they’re actually fat (see again the importance of body condition scoring). A big belly is much more likely to be a symptom of a lack of protein in their diet, malnutrition, or a simple lack of fitness, than it is a result of being overweight. And winter hair has fooled many a Miniature Horse owner – don’t trust your eyes. But if they ARE fat? Look to the rest of your diet first. Because hay seems like the biggest thing you’re feeding, it’s the inclination of most people to cut down the hay first, rather than any concentrates your’re feeding. But the concentrates are almost always the high fat, high starch, high sugar portion of the diet, and even in small amounts can result in weight gain – after all, that’s their job! When you’re looking for weight loss, cut down every other part of their diet first, before reducing their forage. 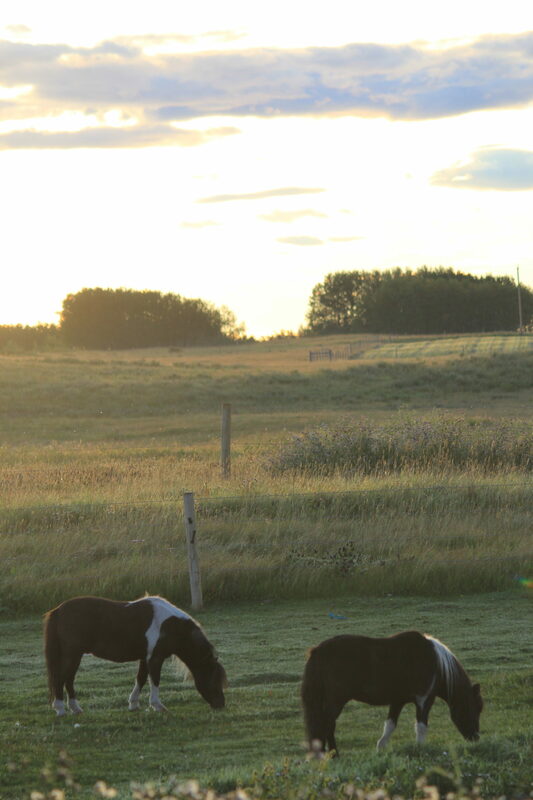 If, after you’ve removed additional nutrition, they’re still overweight, then you can reduce their forage. Never, ever should a horse be fed less than 1% of their body weight in forage per day – that’s the minimum they need to stay healthy. Every time your horse has an empty stomach, they’re at a risk of gastric ulcers. If your horse is fed in twice daily meals that he eats in 30 minutes or less, he’s probably got an empty belly a lot. If you’ve decided your horse needs to be on a restricted forage diet, then you need to find a way to keep them eating that forage for most of their day. The best buffer of stomach acid is saliva. The best way to keep them healthy is to keep them eating. Use frequent meals, use a slow feed net – whatever you can do to keep them eating. And never, ever less than 1% of their body weight in forage per day. Really and truly. They can eat grass, they can eat hay – and they should! – in appropriate amounts for their size and individual metabolism.